Many people are discontent with their crooked or crowded teeth. However, as an adult or older teen, you may feel more apprehensive about braving your social and professional life with metal brackets and wires adorning your teeth every day. Considering the fact that most traditional orthodontic treatments (i.e., metal braces) can last two years or more, that apprehension is understandable. Nevertheless, ignoring your misaligned teeth is never preferable over correcting them. To help encourage you to stop procrastinating and straighten your errant teeth, Celina dentist, Dr. Ganjoor, introduces our innovative Fastbraces, which can achieve the same results as traditional braces, but in considerably less time and with more attention to discretion. 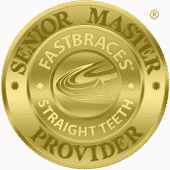 The secret behind the success of Fastbraces treatment is a minor shift in philosophy. Traditional metal braces realign your teeth in stages, concentrating first on moving the crowns of your teeth (the top, visible parts), and then shifting focus to move your teeth’s roots into their desired positions. By contrast, Fastbraces utilizes redesigned brackets and a single wire to move crowns and roots simultaneously, significantly reducing the amount of time needed for successful treatment. Most patients report considerably less discomfort when compared to traditional braces, and you can choose clear brackets and white wire that blend in with our teeth, making your braces virtually undetectable from a distance and in most photos. Straightening your teeth shouldn’t be a debate, but if you’re concerned about esthetics during the course of your treatment, we offer a variety of choices aside from traditional and Fastbraces to suit your specific needs. To learn more about the necessity of straight teeth, or to find out which cosmetic dental treatment is the right choice for you, schedule an appointment with Dr. Ganjoor at our Celina dentist’s office by calling (214) 851-0130. Located in the 75009 area, we serve patients of all ages from Celina, Prosper, McKinney, Frisco, Anna, Pilot Point, and the surrounding areas.